Recently I've hit up Sephora a few times and I thought it would be fun to share what I bought. I'm sure that you'll be able to tell from my purchases that the sheet mask obsession is so real for me right now. 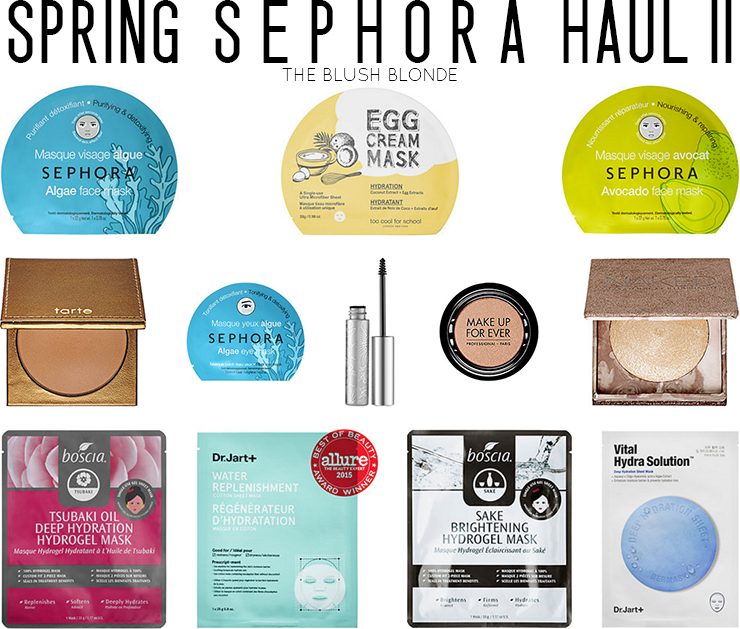 Below is my second Spring Sephora Haul. I'm a big fan of the Sephora brand sheet masks - they're great quality and a good price at $6.00 each. I originally bought this for my sister, but she didn't use it so I landed up stealing it the other night. This mask uses algae to detox skin to make it look more radiant. It helped me with some skin congestion I was experiencing without drying my skin out. I think this would especially be good for the summer months when my skin needs a gentle cleaning. As I mentioned in my post last Wednesday this is my favorite sheet mask I've tried. It brightens my skin without making it dry, which is an issue I've had with some other brightening masks. In addition to not drying out my skin it does a great job at providing the extra hydration it needs. It also tightens pores and gives your skin an all over glow. Repurchase? Yes. This sheet mask actually comes in a five pack and I am planning on purchasing that because I love it so much! Repurchase? Not sure. I haven't tried yet. I was looking for a matte bronzer that would compliment my very fair skin and not make me look orange. I did some research and several websites recommended this because it looks great on all skin tones - even the super pale. I wanted a bronzer for the warmer months to warm up my complexion and to experiment with contouring. I haven't worn bronzer in forever so I'm still playing around with this, but I like that the color is very buildable. Repurchase? Not sure. I won't know if I'll repurchase until I use it more. Since I love their sheet masks so much I figured trying the Sephora brand eye sheet masks was a no brainer. The Algae Eye Mask tones and detoxes around the eyes to give them a fresh look. I brought these to use before graduation because I knew that I would be tired coming off Senior Week. I used these the night before the first ceremony and they helped to brighten the skin around my eyes. This made its way into my Must Have post from last week. This has been a game changer for me and I am completely hooked on it! Like I said in my previous post my eyelashes are naturally super long and my bottom lashes touch under my eyes, which means I've always had an issue with mascara flaking and rubbing off under my eyes. I figured for Senior Ball and graduation I would give this a try so have to worry about wiping away flakes all the time and it worked amazing. This is the only mascara I've ever used that actually stays on my bottom lashes until I take it off, which is a miracle for me. I purchased this for my Mom. I haven't used any MAKE UP FOR EVER products, but I had heard good things and their eyeshadows came in so many gorgeous colors so I turned to them when my Mom asked me for eyeshadow. The color is actually lighter in person than online, but it is beautiful; it's a perfect base eyeshadow. She loves the way it goes on and it has a nice subtle shimmer to it. This also made its way into my Must Have post from last week. I purchased this as a highlighter to use when learning to contour; however, after I ordered it I read a lot of reviews that it wasn't a highlighter, but just a sparkle powder and I began to panic. When it came in I figured I had to give it a try and if I didn't like it I would return it. I was pleasantly surprised with how much I liked this though; I would categorize it as a light highlighter because it does deposit a highlighter color on my skin. In addition to the color it has the most beautiful iridescent shimmer that I absolutely love! My favorite part of this is the way it looks along the tops of cheekbones layered over blush. First off I have to tell you that this sheet mask is actually pink, which is so fun! The boscia sheet masks are hands down the best fitting sheet masks I've tried, they come in two pieces and because they are made of hydrogel (instead of paper like fibers that most sheet masks are made of) it molds to the shape of your face really well. This mask was helpful when I was in need of some extra hydration and made my skin super smooth. I loved it so much that I landed up going back and buying a second one for my Mom to try because she has super dry skin too. Last week to prep for all the graduation pictures we knew we'd be taking we had a sheet mask night together and she loved this! I had been waiting to try this for a while, but it's always sold out on Sephora's website because it's so popular. Luckily when I ran into Sephora one day to get the Clinique mascara from above they had one so I had to get it! It even won an Allure's Best of Beauty Award in 2015. This mask gives your skin a major dose of water and does an amazing job of hydrating. It's super refreshing and hydrates without clogging pores. This mask is great for all skin types, even those who are acne prone or oily. When I went to repurchase the Too Cool For School Egg Cream Sheet Mask the Sephora I was at was out so I decided to give this a try. It's the same design as the boscia Tsubaki Oil Deep Hydration Hydrogel Mask and fit my face really well. Although I liked the Too Cool For School Egg Cream Sheet Mask better I was overall a fan of this. It brightened and hydrated my skin, but my favorite part was the dose of antioxidants it provides. This mask not only hydrates skin, but it helps to strengthen the skin's moisture barrier as well. Using this will help your skin to better hold in moisture in the future. In addition to hydrating it also uses seaweed extract to purify skin. I was really pleased with the results from using this and I could actually feel the difference in the hydration levels. Have you made any recent Sephora purchases? The Egg Cream Sheet Mask sounds interesting! I'll look for it next time I'm at Sephora. You have so many wonderful face masks both that you have tried and that you are trying soon! I've never tried the egg cream mask you mentioned, it sounds so great though it's on my wishlist! So many great masks. Sephora can be a dangerous place for my bank account lol. So many fun masks that I'd love to try! I've never done one but I feel like I'd love it. I LOVE the Sephora brand face masks. Great picks! These are great finds - Sephora makes it nearly impossible to walk into without dropping way too much money lol!